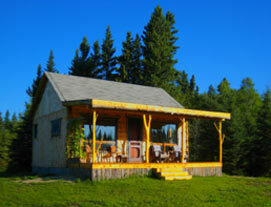 atmosphere synonymous with Crooked Mountain and concur that ‘less is definitely more’ when it comes to cabin count. Availability has been intentionally limited to just four unique cabins in an effort to maintain a high quality experience in relation to the natural surroundings. 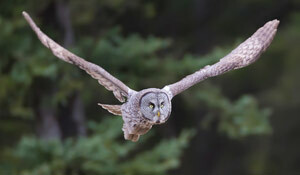 Many bird species (including the Great Grey Owl) have made the forest their home and share it with an abundance of other furry creatures, both large and small. Groomed hiking/biking trails meander throughout the entire area, so whether you prefer to spend your time soaking up the tranquility or exploring the mossy forest paths, you are sure to rejuvenate and feel at peace in this laissez-faire atmosphere. At the end of a full and busy day spent up at the Park, many guests comment that they can‘t wait to retreat home to their quiet little cabin in the hills; sip a glass of wine, prepare a delicious dinner, and sit back on their deck to watch the sun go down! Quite simply, they experience the best of both worlds. 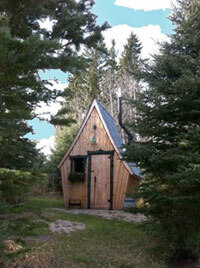 The cabins are easily accessible. 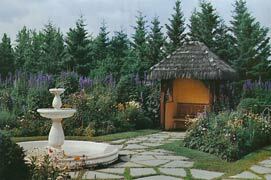 Just 2.5 hours from Winnipeg and 1 hour from Brandon… they provide the perfect eco-friendly vacation for any visitor. Life becomes simple and easy. Interior walls, hand washed in Mediterranean white adobe are decorated with tasteful antique accents. Climbing vines of virginia creeper and purple blue clematis engulf the exterior walls while strategic plantings provide natural privacy between dwellings. Each little cabin is its own ‘home away from home’ totally self contained and fully equipped with all amenities (fridge, stove, microwave, coffee maker, toaster, etc.) For your convenience, the following items are also supplied: bed linens, blankets, towels (except beach), toilet paper, kleenex, paper towels, dish soap, bar soap, saran, tinfoil, coffee filters, salt, pepper, and sugar. There is a BBQ on each deck and high speed internet connection for those who prefer to stay on the grid. This can come in handy up on the mountain as cell phone reception is not always reliable! Excellent bedside lamps make for an easy read while ceiling fans provide cool relief on those hot summer nights.